General William Tecumseh Sherman called it "wonderfully realistic and historically reminiscent." Mark Twain termed it genuine "down to its smallest details." Even General George Armstrong Custer's widow endorsed its depiction of her husband's "Last Stand." 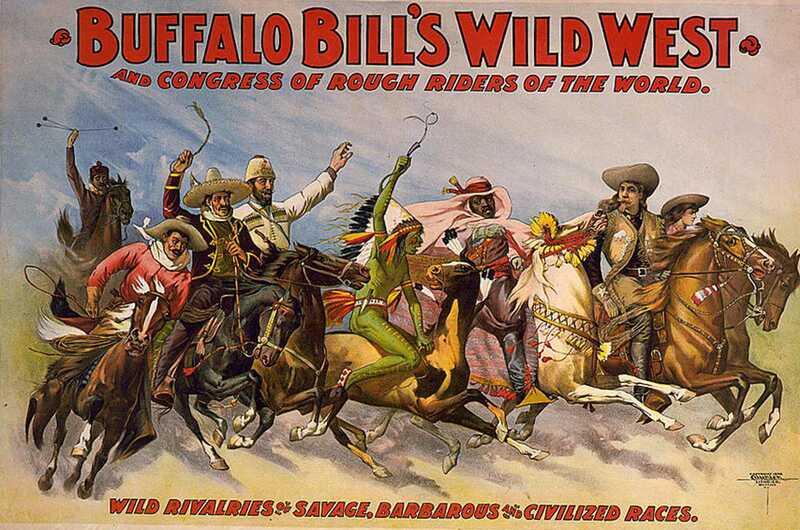 But just how accurate was Buffalo Bill Cody's Wild West show? The buffalo were real, to begin with. So was Bill Cody. He had grown up in Kansas during the period of intensive Western migration, had served as a scout during the Indian Wars, and had even ridden for the Pony Express. The Deadwood stagecoach was real, too — Cody had gotten it from the manager of the Cheyenne and Black Hills line, and, just as the show depicted, the Deadwood coach had once been attacked by Indians. As for the Native American performers, some of them had even participated in the battle of the Little Big Horn that they reenacted. But not everyone in Cody's show had authentic Western roots. Annie Oakley was born in Ohio and never visited the West until she was a member of Cody's show. Nor was she the only one. "Texas Girl" Lillian Ward was a Brooklyn native, and sharpshooter May Lillie came from Philadelphia. Their presentation in an "authentic" Wild West show encouraged audiences to imagine these women were real cowgirls, "a credit to the 'glorious country' beyond the Rockies," in one newspaper's phrase. Ironically, one female performer with real Western roots, Lillian Smith, was criticized by Oakley for her uncouth manner and soon left Cody's show. The Wild West show also encouraged a certain view of events in that part of the country, one that was both romantic and militaristic. Cody's show could be forgiven for not dwelling on the physical hardships of life on the frontier — the mosquitoes, blizzards, boredom, drunkenness, and rabid wolves. 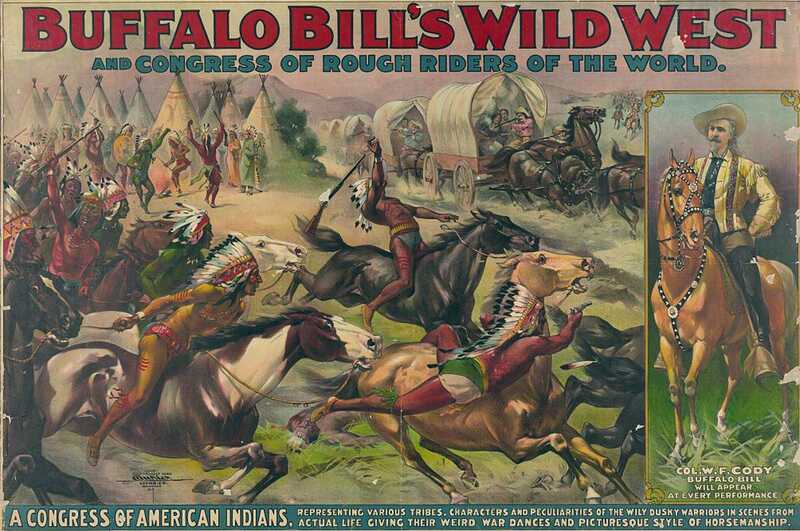 But the show's depictions of Indians reinforced an inaccurate notion held by white Americans. In Cody's Wild West, the Indians were always the aggressors -- attacking wagon trains, settlers' cabins, and Custer's forces. The reality was quite different — attacks on settlers' wagons had been quite rare, and it was the whites who kept breaking treaties with the Indians, not the other way around. The 1876 war which cost Custer his life was a good example -- the area fought over was given to the Sioux by treaty, but after gold was discovered in the Black Hills, Indians were ordered off the land and onto reservations, with federal troops sent after those who refused. Even the practice of scalping, widely attributed to Native Americans, could be traced back to ancient Greece and had been introduced to North America by the Spanish. Cody himself maintained largely good relations with the Indians in his show, including legendary Sioux warrior Sitting Bull. But promoting the idea of Indians as aggressive warriors had dangerous consequences in a country where the Nebraska City Press had already suggested that whites should "exterminate the whole fraternity of redskins." Some of Cody's inaccuracy wasdeliberate, while some reflected the passage of time. During its 30-year run, which began in 1883, the Wild West went from a semi-authentic depiction of the experiences Cody and some of his performers had known, conveniently presented in the East for Easterners, to a historical recreation of times gone by. The United States Census Bureau officially declared the frontier closed in 1890, while historian Frederick Jackson Turner bemoaned its end in a famous paper at the same 1893 Columbia Exposition in Chicago at which Cody's show played to such acclaim. By 1893, buffalo could still be "hunted" in Cody's Wild West, but not many other places -- where once millions had roamed the Western plains, now there were "not so many buffaloes on the whole American continent" as there were in his show, Cody said. By the end of the Wild West, spectators were arriving in automobiles to watch men on horseback, and nickelodeons were showing the future of mass entertainment. Talking motion pictures were only a decade away when Cody died in 1917, and his romantic images of a West where cowboys battled Indians would shape the Hollywood Western for decades to come. 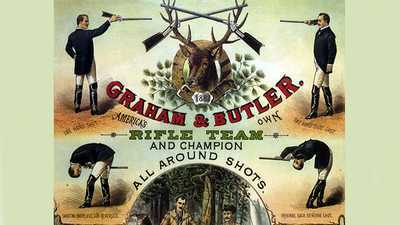 Although he never expected to be shooting against a woman, Frank Butler accepted defeat from Annie Oakley graciously. 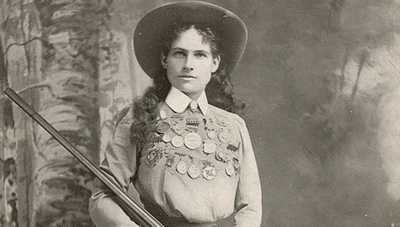 Annie Oakley used her astonishing marksmanship to escape a poor childhood and become a superstar. 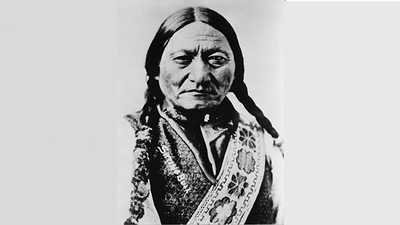 Sitting Bull was the political and spiritual leader of the Sioux warriors who destroyed General Custer's force in the famous battle of Little Big Horn.